St Lucia is becoming a popular food destination in the Caribbean show casing our local flavors and spices. As you may remember, Nina Compton, a famous chef from the island, competed on Season 11 of Top Chef and finishing as a runner up and fan favorite. Chef Nina was appointed culinary ambassador of St Lucia, and proudly so. 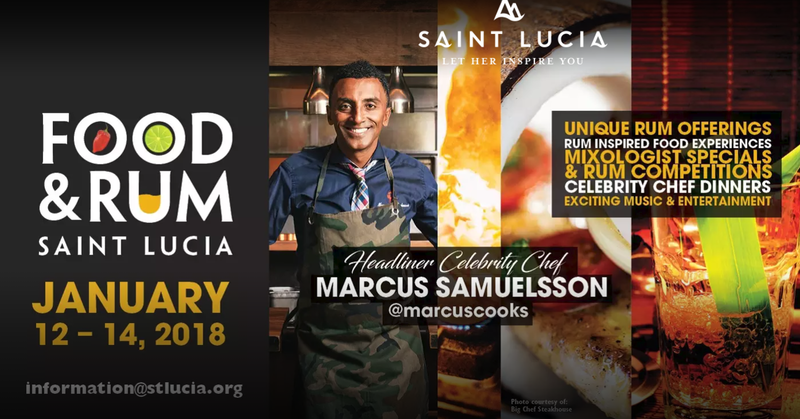 Now having our first annual St. Lucia food & rum festival only made sense to showcase to the world our sensational flavors the island has to offer. Participating restaurants throughout the island were offering exciting rum infused dishes. This year’s festival was from January 12-14, 2018 and was featuring winning Chef, tv personality and restaurateur, Marcus Samuelsson. For a unique experience a celebrity dinner prepared by Chef Samuelsson himself, giving a St Lucian twist, to his menu from President Obama’s first state dinner. This is a great festival for anyone who enjoys delicious food and cocktails! It’s a must if you’re visiting the island in January. Hope to see you next year for St Lucia’s Food & Rum Festival!